Cambodia is one of the wonderful destinations attracting a lot of international tourists in Southeast Asia. Coming to the Empire of Temples, you will have the opportunity to admire the relic sites such as the complex of Angkor Wat or Angkor Thom, the landscape of Tonle Sap and Mekong River with many beautiful beaches and islands such as Song Saam Koh Rong and Koh Tonsay. 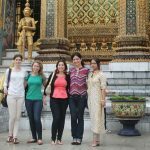 Let’s check out 3 best things to do in Cambodia as follow. As the land of ancient and mystic temples, coming to Cambodia, tourists will experience the Khmer culture, nature and country here. The complex of Angkor with its mystical beauty may be the most well-known destination the tourists cannot miss in the journey of discovering the empire of temples. In this complex, Ta Prohm is the most special temple. It was built in Bayon style at the end of 12th century to the beginning of 13th century. Unlike other temples in Angkor, Ta Prohm seemed to be forgotten. It has been well-known again after being the scene in the movie “The secret of ancient tomb” with the presence of famous actress Angelina Jolie. Ta Prohm is surrounded by rainforests, with the roots of ancient trees clinging to stone pillars, ceiling or around the walls. They make Ta Prohm become more special and mysterious. 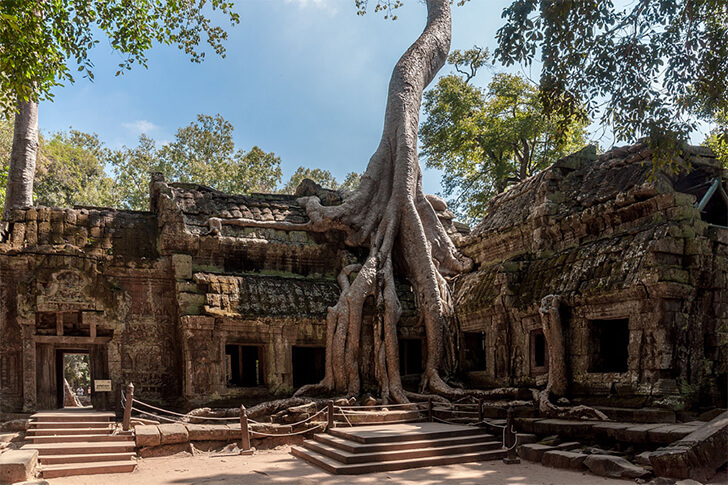 At the end of the 20th century to the beginning of the 21st century, in the conservation of Angkor, the Ta Prohm temple was found. In 2013, archaeological research in India has restored most parts of the temple, including wooden walkways and balustrades to preserve remnants of ruins and prevent them from collapsing. Preah Khan Temple, also known as Jayaasri (which means the sword of the saints), is one of the great temples in Angkor. The temple owns an ancient, sacred and wild beauty. 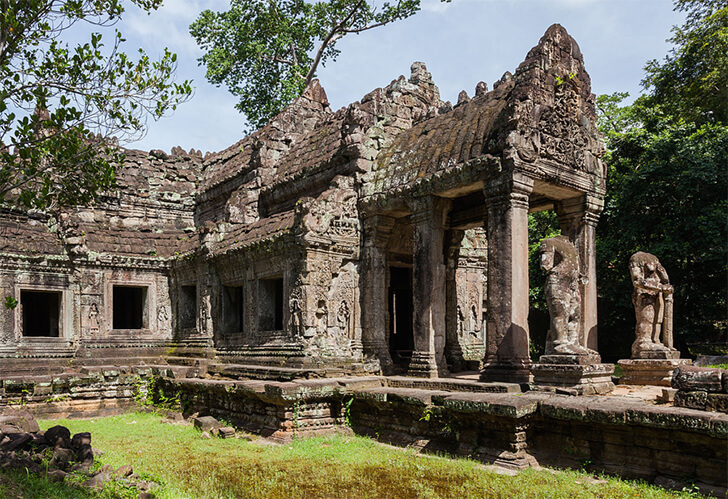 In 1191, Preah Khan Temple was built by King Jayavarman VII to commemorate his father, King Jayavarman VI. Like the other temples, Preah Khan was abandoned after the Khmer empire collapsed. The temple is located far from the center, in the northeast of Angkor Thom, so visitors rarely visit this temple because it is too far. Banteay Kdei Temple is a temple in the Angkor region. 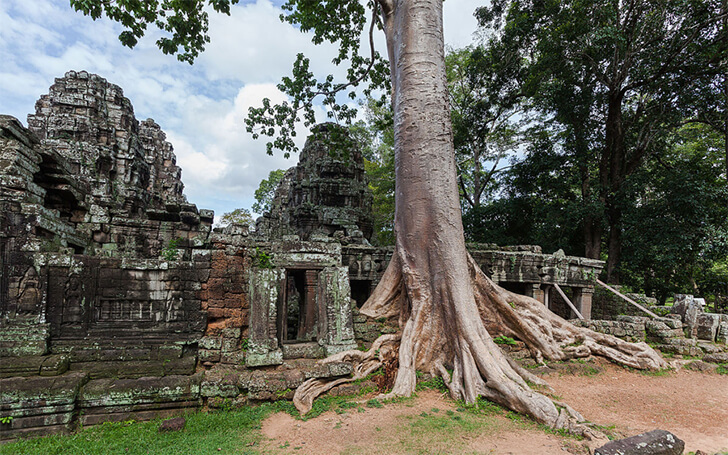 The temple is located in the southeast of Ta Prohm and in the east of Angkor Thom. At present, the Banteay Kdei Temple falls into a severe condition. Some of the temple's large structures have collapsed. In here, the Buddha statues are mostly damaged due to the breakdown over time. However, anyone who visits Banteay Kdei temple will feel the sacred as well as mysterious beauty when entering the temple. Angkor Wat is considered “the eldest brother” of the temples in Cambodia and the pinnacle of Khmer architecture. It is a UNESCO World Heritage Site and a must-see destination for tourists visiting Cambodia. Angkor Wat was built in the 11th century by King Suryavarman II. Initially, the temple was built for the Hindus, but when the Khmer dynasty under the Buddhist rule, Angkor Wat temple became a place of worship of the Buddhists. The temple is really beautiful and dazzling. At different times of the day, in the sun, the temple reappears in a colorful setting. With 443km of the coastline along the Gulf of Thailand, Cambodia is famous for many beautiful beaches and islands. In this article, we will introduce 3 most beautiful island in Cambodia. 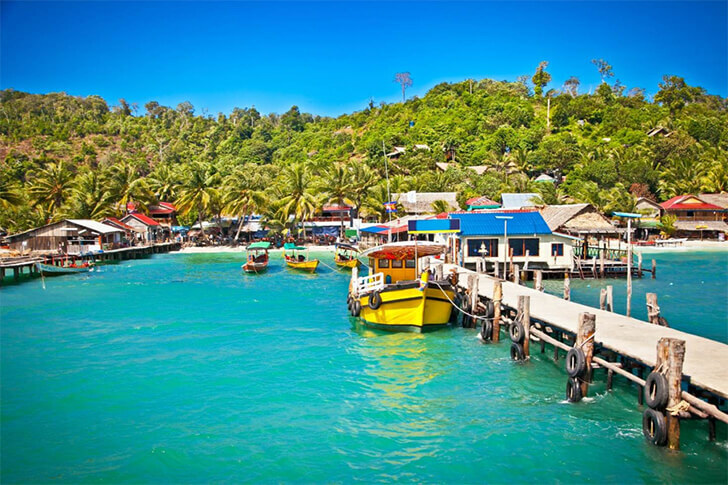 Song Saa is located on 2 islands of Koh Ouen and Koh Bong, belonged to Koh Rong Archipelago. 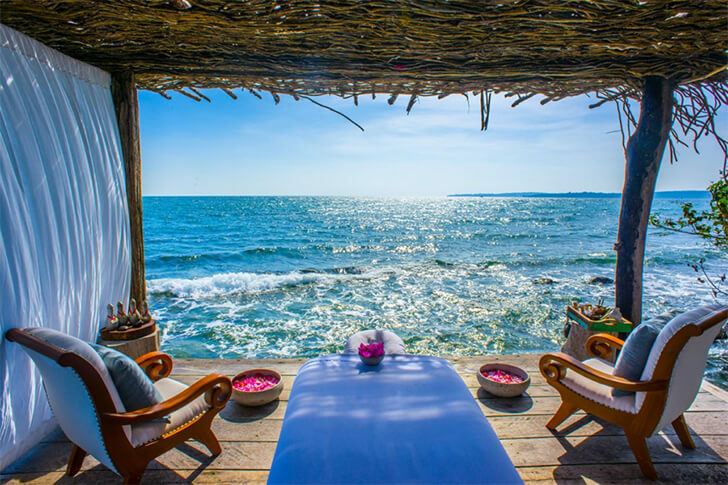 In Khmer language, Song Saa means “love each other” so the island is an ideal place for couples to enjoy their sweet honeymoon. To get to Song Saa, you have to move to Sihanoukville by motorbike or bus. After that, the resort will offer the free service of picking up tourists from Sihanoukville International Airport and taking them to Song Saa Island by boat. The resorts in Song Saa will provide for tourists 2 selections: staying in the villas floating on the sea or being built in the forest. All the villas here are designed in the featured Cambodian architectural style. Each villa has a private swimming pool and 1 or 2 bedrooms. The price of a room may be up to 3,000USD/night. Located in the south of Cambodia, 20km from the sea city of Shihanoukville, Koh Rong is really a gem in the middle of the sea. It is a wild and gentle paradise which makes you impressed immediately when coming here. You are free to relax in the clear and warm sea of the tropical region. In Koh Rong, the small bungalows scattered along the sea or in the trees are suitable for those who love the quietness. Besides, trekking and discovering tropical rainforests are also attractive activities in Koh Rong. Koh Tonsay, also known as the island of rabbits, is an island in the south of Cambodia, about 4.6km from Kep City. Compared to Koh Rong, Koh Tonsay is quite wild because not many tourists come here. Visiting Koh Tonsay, you will have a comfortable feeling thanks to the lush vegetation, clear blue sea, white sand beach, many coral species and abundant marine life. In particular, the sea around Koh Tonsay is quite shallow and its bottom is sloping slowly, making it an ideal place for swimming. Most visitors come to Koh Tonsay Island in the morning and return to the mainland in the afternoon, but some others want to spend the night on the island for a new experience. At present, on the island, there are about 5-7 households providing guesthouse services with about 20 small and lovely bungalows along the beach made of coconut leaves. The price of hostels on the island is quite cheap, only from 5-7 USD/bungalow. Cambodia has enough the forest, sea, mountain, and river so it is no surprise that Cambodian cuisine is quite rich. On the journey of discovering this country, do not forget to enjoy the following famous food. 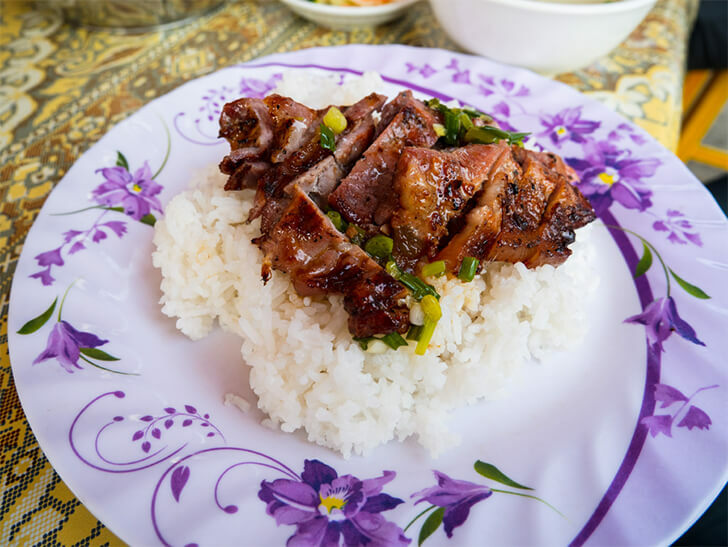 Bai sach chrouk or the rice with pork is the simplest dish in this country. The pork is marinated in the coconut milk or garlic and baked on charcoal. This has made the dish special taste. Accompanied by pork are the broken rice, cucumber, radish, ginger and a bowl of broth with the fresh onions and aromatic dried onions. It is a beef salad of Cambodia. The beef after quickly grilled will be sliced and mixed with lemon juice, onion, garlic, fish sauce, basil, mint, cowpea, fresh pepper, and chili. Nom banh chok may be called as the Khmer noodle. This dish includes the main ingredients sucy as green curry with fish, turmeric, and lemon. Some kinds of vegetables such as Fresh mint leaves, cowpea, banana powder, and cucumber are also served with this dish. Kdam chaa or fried crab is a famous specialty of Kep Town. This dish is more delicious when served with Kampot green pepper which you can only enjoy when traveling to Cambodia. In the coastal areas of Cambodia, such as Sihanoukville and Kep, the grilled squid is a very popular dish. The squid is marinated with the lemon juice or fish sauce, and then skewed by the bamboo stick before baking. 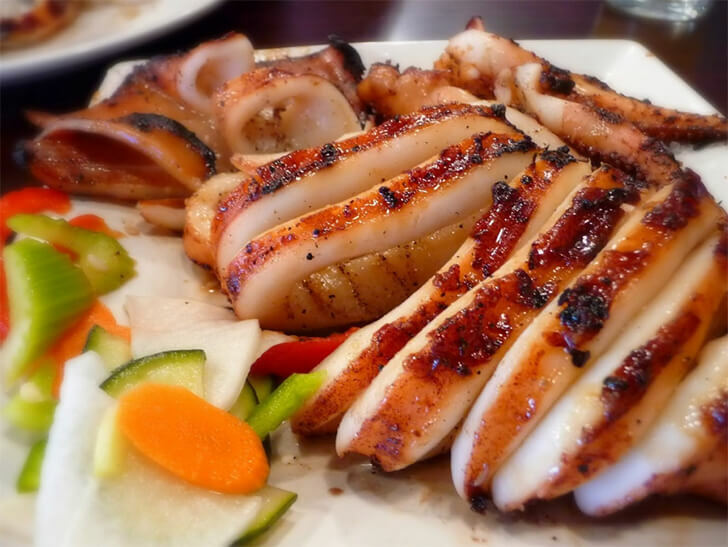 The grilled squid is eaten with the soy sauce, Kampot pepper, garlic, chili, lemon, and sugar. Cha houy teuk has a very rich flavor: red bean, taro, pumpkin, and jackfruit. An indispensable ingredient of this dish is the coconut milk. 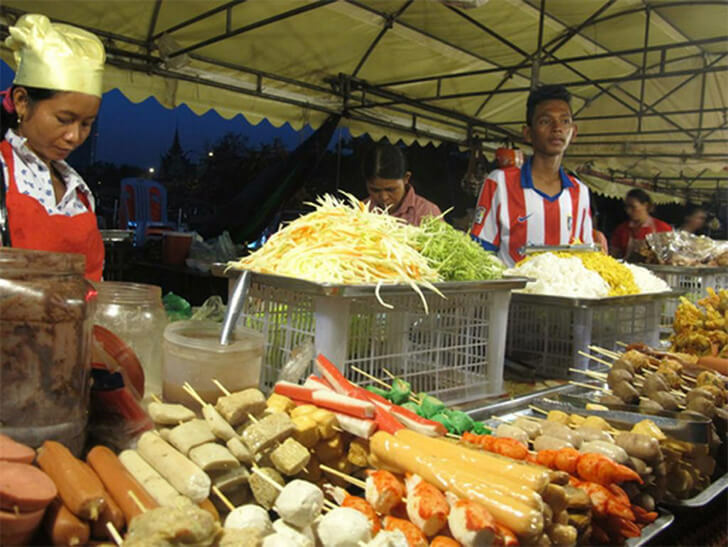 Phsa Reatrey night market and Kanda Market are located on the new Western Street (Sisowath Quay) with Cambodian-style dishes. Veng Nguon Restaurant in Sankat Phsar Kandal 1 which is also located in the heart of Sisowath Quay, serving Nam Vang Noodle Soup. Kiwi Bakery and Restaurant which is located on the corner of Sisowath Boulevard and 130 Road, Phnom Penh. Eateries on the side walk opposite to the Naga World (near the diamond bridge). Particularly, visitors will sit on mats to enjoy the folk food such as duck balut, fried fish balls, beer and soft drinks. Khmer House Restaurant in Old Market, where you can find hundreds of traditional Cambodian dishes. Soup Dragon restaurant in the Old Market, which is famous for Khmer dishes and Western dishes. Khmer Kitchen Restaurant with attractive dishes such as Tom Yum, Tom Kha, curry and grilled rib bone. Temple Restaurant in the Western Quarter (Pub Street) which is specialized in Khmer cuisine. We hope that the above information will be helpful for you. Have a nice trip!